Many people are looking to simplify their dependence, and addiction to smartphones (from Google and iOS), or perhaps you're looking for a simpler phone for use by someone small (like a child), or you want a smaller phone in your pocket, with better battery life. You might also want to avoid Google tracking your every move. You might want to use certain modern apps, such as Whatsapp, or Sat-nav, if possible. 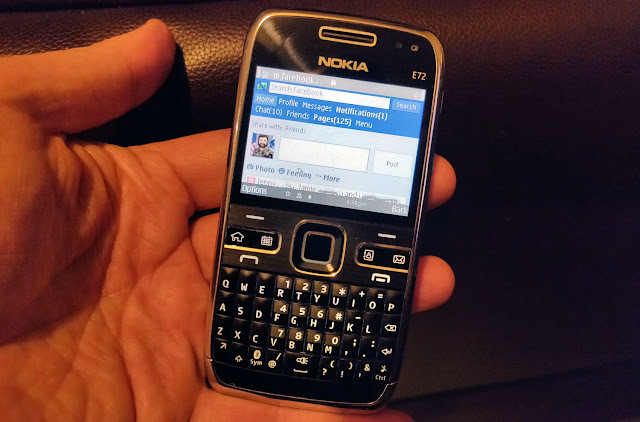 So in order to find out what could be done with an old smartphone, I thought I'd look at what it's like to use an old Symbian Nokia E72 smartphone in 2018. Many modern smartphones have large screens, and on-screen touch keyboards. "Back in the day" when phones didn't always have a large touch-screen, they'd sometimes feature a real keyboard. This is why I went for a Nokia E72, with a keyboard, rather than simply a numeric keypad, as I still wanted to be able to type or write text messages (and potentially emails). Avoiding Google and other companies tracking your every move has become more and more difficult, as smartphones have become an integral part of life. We accept Google knowing everywhere we go because we find Google Maps extremely useful for getting us from point A to point B, for free. We accept tracking of distance and speed travelled, as it informs Google of traffic issues, and can then let other people (and yourself) know that there might be a quicker way to get to where you're going. Sure you can switch off tracking, but other apps may still be tracking you. For example, Google Play services also likes to know where you are, as does Chrome (for "helpful" location based search results). (Google's mail system GMail also likes to read your emails). Use Facebook messenger, and Facebook read (or scan) all your messages, or flag up your message to moderators to read. Photos from a walk around a derelict industrial area right in the centre of Sheffield. Seems graffiti is pretty big in Sheffield, with recognisable styles cropping up all over the place. These photos were taken with the rather nice Fujifilm X10, of which there is a review here. When launched the X10 was very nice, but a tad expensive, but now that it's been out for a while, and been replaced by the X20, it's available for a much better price, and well worth looking at if you like a camera to feel like a camera. Also if you want an optical viewfinder. YOLO. Here's another site with great photos of classic cameras, and the odd test or two: http://camarasclassicas.blogspot.co.uk - if you're interested in "classic" or retro digital cameras, have a look at DigiCamReview:Retro. Great new site discovered today, called 52cameras, and is all about film cameras. Yes, film. Check it out for some major retro goodness.